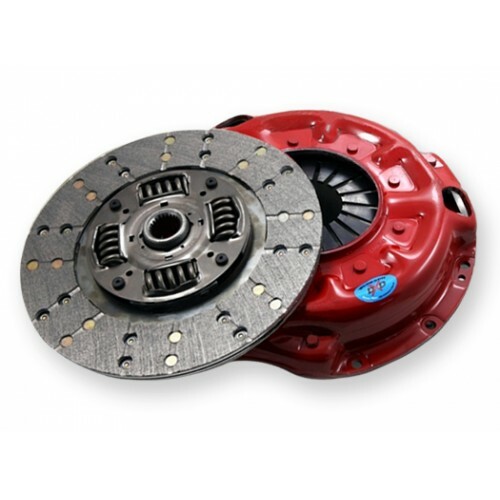 This clutch package is designed for high HP vehicles desiring a start performance similar to O.E. The pressure plate is Race Engineered (SS) and SFI approved with significant load increase over stage 1,2 pressure plates (+600-800 lbs.). Expect a pedal effort increase of 20%-25%. Discs are assembled with heat-treated wear resistant hubs; drive plates and springs for high load transfer and dependable operation. The sprung centers on the disc in conjunction with the marcel fin between the linings create a dual dampening effect that simulates O.E. start performance. A Performance Organic friction material with a high metal content increases torque and RPM capability and maintains low operating temperatures which reduces wear and glazing. This clutch package is built to handle heavily modified cars and designed to function according to the specific needs of the 1/4 and 1/8 mile track. The pressure plate for this kit is SFI approved Race Cover engineered to disengage with less pedal travel shortening the shift time. Discs are a puck design, which reduces rotational mass and are assembled with all high carbon component pieces for maximum strength. The friction material used is Graphite impregnated Ceramic perfectly suited for drag racing because of its maximum friction co-efficient, rapid heat dissipation and abrupt engagement characteristics. The disc is designed for the special needs of a vehicle with circuit racing in mind. Kevlar friction material is used for its unique static to dynamic ratios of friction co-efficients at high energy levels. This translates to a perfect transition from one gear to the next. Discs are assembled with only performance components and equipped with torsion springs functioning as a damper between engine and gearbox. This kit uses the same Race Engineered SFI approved pressure plate as stage 3 daily package. Race engineered pressure plates deliver more transmittable torque and stability, longer life and superior thermal resistance. They also deliver noticeably better dynamics through higher clamp load when driving the vehicle to its limits. Conservatively rated to hold 535lbs/ft of torque.